We’ve never seen the northern lights in Alberta, or elsewhere in Canada, or anywhere for that matter. So when Jon Reaves sent us this northern lights photo, we learned there are designated “dark sky” places in the world where artificial lighting is prohibited – goodbye light pollution, hello stargazing! 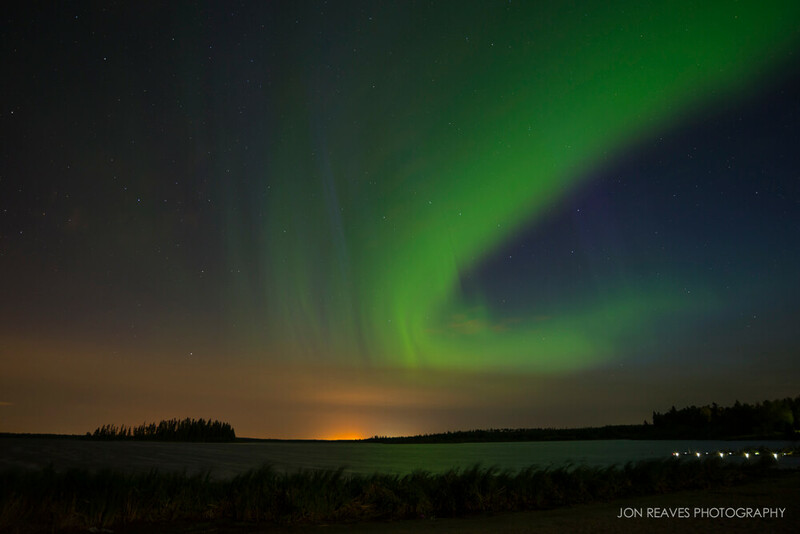 Jon took this picture in Elk Island National Park, part of a Dark-Sky Preserve, and it’s one of the best places in Canada (indeed, the world) to catch a northern lights show (Jasper National Park is another). “Most people imagine a northern lights experience going something like this: A chilly winter night, cuddled up under a warm blanket beneath the stars, drinking hot cocoa and watching the aurora dance and ripple in magnificent shades of blue and green across the sky, with subtle reflections of color on a frozen lake surrounded by snowy hills. Sounds great doesn’t it? I’ve yet to have such an experience. I tried taking northern lights photos in Iceland several times – and failed. It took moving to the Canadian north before I saw the aurora borealis for the first time, where I caught the northern lights in Alberta. And, ironically, my first experience was in high summer in July. It was a hot night, the air was thick, and I was ravaged by mosquitos the whole time. Welcome to the north, eh? That isn’t to say it wasn’t a magical experience. I’ll remember it forever, even if I (and I assume I will) have more experiences with stronger aurora activity in the future. That night, I checked the northern lights forecast online and decided conditions were promising. So I headed out to Elk Island National Park (a place I love to go to photograph bison), where I hung around for a few hours, hiding from mosquitoes in my car until well after midnight. I was just about to head home when the lights came. At first, it was as a faint, pale, greenish band that almost looked like a cloud. Then it got brighter and brighter until there was no mistaking it – the aurora had arrived. I grabbed my tripod and camera (already preset for the occasion) and sprinted down the beach of Astotin Lake until I found a composition. The aurora actually became stronger after I took this photo. I was trying different compositions in the forest by that time, but those images aren’t great because a heavy breeze was swaying the trees – thus blurring them during the long exposure time necessary to capture the northern lights. The orange light on the horizon is actually from downtown Edmonton, 40 minutes to the west. The small dots of light in the lower right corner of this northern lights photo are from a small dock on the lake. 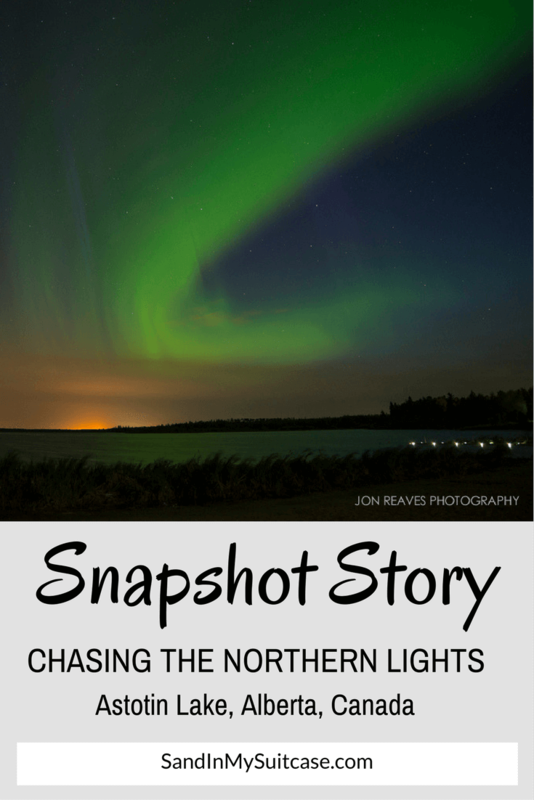 Jon Reaves is a travel and nature photographer based in Edmonton, Canada. His images have been licensed for editorial and commercial use all over the world. Jon splits his time between traveling internationally and making frequent visits to the Canadian Rockies. His experiences are chronicled on his travel blog, Maps & Cameras. This is so amazing; I hope I’ll see it when I visit Alberta soon. Hope you get to see the Northern Lights too! They would be amazing to see :-). I’ve never had the opportunity to see the Northern Lights but this photo has whet my appetite!